Spring is in the air around here and I am loving it! All the citrus trees in our backyard are in full bloom and the backyard smells oh-so-wonderful! Meyer lemons and blood oranges are easily two of my favorite things about Spring. 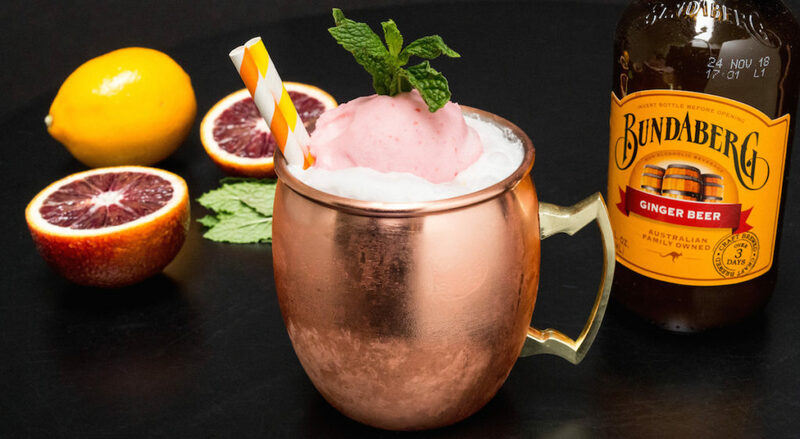 Last year, I combined the juice of both citruses to create this Blood Orange & Meyer Lemon Moscow Mule. It’s starting to get warm around here and I’m already thinking about all the cocktails I want to drink to cool me down. 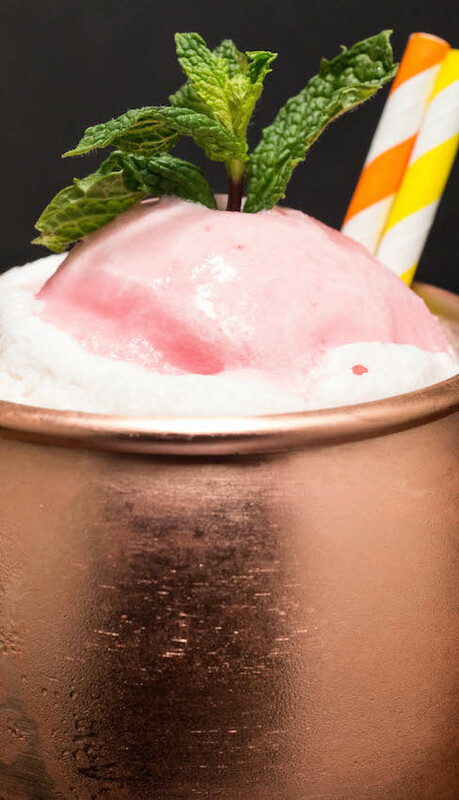 It only made sense to turn my previous recipe into a Moscow mule float! I took freshly squeezed juice from blood oranges and Meyer lemons and used it to make a sherbet. The sherbet by itself is amazing. The sweet blood orange perfectly blends with slightly tangy Meyer lemon to create a truly tasty refreshing treat. This will definitely be making an appearance at our Easter brunch this weekend. And many more brunches and weekends in the future – I’m sure of it! Whisk all ingredients together in a large bowl. Once well combined, place in the refrigerator to chill at least two hours. When chilled, add to your ice cream maker and follow the manufacturer’s instructions. (I use this one and churn for 20 minutes). Transfer to an airtight ice cream container or a bread pan tightly saran wrapped. Chill another couple of hours, until ice cream is the preferred consistency. Add 1/4 cup vodka to the bottom of each glass you are using. 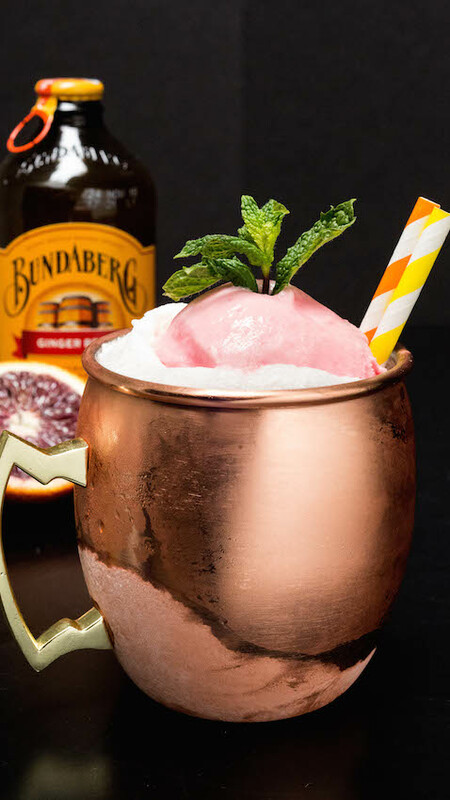 (Moscow mule is traditionally served in a copper mug). Next, place 2-3 scoops of the blood orange & Meyer lemon sherbet in the glass. Slowly pour in the ginger beer. Add mint for garnish, if desired. I love Bundaberg! And that mug! And sherbet! Okay, I think it’s safe to say I love everything about this.